Have you ever wanted to make your own neon sign? You may soon be in luck. Chicago neon artists, led by a longtime art professor, plan to offer art classes and studio space in Rogers Park, where beginners and accomplished artists alike can learn, work and showcase their wares. The Chicago Neon Community Co-Op is the brainchild of Greg Mowery, who’s taught neon art at the School of the Art Institute of Chicago for more than 30 years. Greg Mowery bends glass at the School of the Art Institute of Chicago’s Light Lab. Mowery has taught neon art at the school for more than 30 years. A neon sign or object is essentially a glass tube that’s been bent at about 1,400 degrees Fahrenheit to form a certain shape. All air and impurities are removed from the tube via vacuum and it’s filled with an inert gas that’s electrified, giving off light. In Mowery’s Neon Techniques class at the SAIC, they use the gases neon, argon and krypton. Once students leave Mowery’s class, however, they don’t have access to the school’s equipment or lab, per school policy. The medium requires a great deal of equipment, including flame torches and a transformer which sends a current tantamount to an electric chair, according to Mowery. “This is a very dangerous process,” he said. 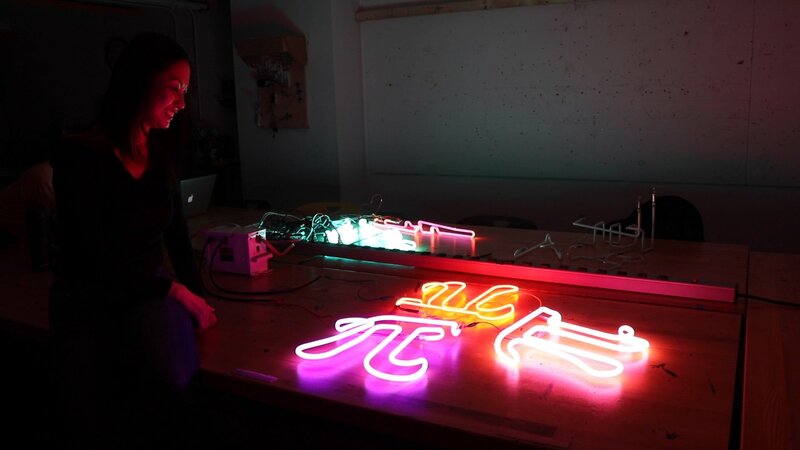 Neon artist Audra Jacot lights up one of her works at the School of the Art Institute of Chicago’s Light Lab. Neon Design owner Charles Evanson bends glass in Rogers Park. Neon artist Lisa Chen bends a glass tube at the School of the Art Institute of Chicago’s Light Lab. School of the Art Institute of Chicago student Tia Mitchell fires up a ribbon burner torch in Greg Mowery’s Neon Techniques class. Our WTTW neon sign is filled with argon gas and mercury within a phosphor-coated glass tube. Mowery and a handful of former students are still raising money for additional equipment and renovations to the space, but they plan to open it to the public by the summer of 2020. The co-op will share space at 519 Howard St. with Neon Design, which is opening at this new location in a few weeks. Business and building owner Charles Evanson said he looks forward to possibly poaching some talent from the future co-op. “I’m selfishly looking at them as a talent pool to choose from down the road,” Evanson said. Note: This story was first published on April 12, 2019.